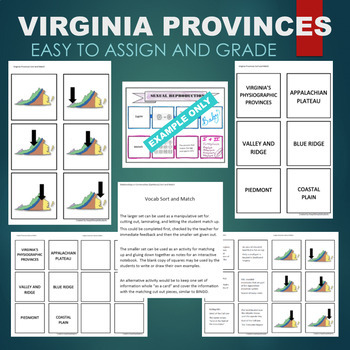 This no-prep activity involves matching the following 5 Virginia Provinces (Appalachian Plateau, Valley and Ridge, Blue Ridge, Piedmont, Coastal Plain/ Tidewater) to descriptions and images. These provinces are also known as geologic, geographic or physiographic regions. It can be used as a hands-on sort and match or cut apart and glued into an interactive notebook. Two sizes of templates are available in this download. Instructions and suggestions are included in this product as well as a numbered answer key.